Gearing up for your New Year’s resolutions to get fit, do more or do less? Don’t forget your online life. For most of us, smartphones and computers are the main repository of our favorite photos, our biggest work projects, and of course our greatest sources of entertainment. With all of 2017 stretching ahead, now’s the perfect time to set in place some healthy habits for managing your technology. 1. Sort out your antivirus protection. After a year when the volume of malware attacks nearly doubled between March and June and as ransomware continues to hold American users as digital hostages, you need a solid antivirus program. Antivirus protection is key for keeping out malicious software that can slow your computer or expose your most sensitive data whether you use a PC or a Mac. Many free antivirus programs block the bulk of malware before it can affect your system. Many attacks still succeed, however, thanks to human error. No antivirus program can prevent someone from voluntarily downloading a program from a malicious site or clicking a scam link that looks legitimate at first glace (an attack known as phishing). Paid antivirus programs block phishing links, alert you to potentially malicious sites, and offer additional encryption for banking online. Look over the reviews and ratings of our favorite free and paid antivirus programs of the year. Android users may want to consider a mobile anti-virus app. The recently uncovered Gooligan malware, for instance, affects devices that download seemingly innocuous apps from non-official sites, setting the phone to download more apps in a scam to score ad revenue. Try AVAST, AVG, Kaspersky, McAfee or Norton, all free for Android. Antivirus programs aren’t available for iOS because it's still relatively difficult and rare to jailbreak an iOS device and download non-official apps. If you’re a mastermind who’s memorized every one of your dozens of uncrackable passphrases for every one of your online accounts, more power to you. But if you reuse passwords, use easy-to-crack passwords or constantly forget the latest fiendish code you’ve devised to guard an account, a password manager is a must-download this year. The best password managers generate tough new passwords for new accounts and check existing passwords for weaknesses that need updating. Paid versions let you access your password bank on multiple devices. Check out our recommended password managers. For added security on sensitive accounts such as email or financial accounts, turn on two-factor authentication to require an additional code whenever you log in using a different computer or device. Guilty of hitting cancel every time Adobe suggests you download (yet) another update to Reader? It's time to get serious about running software updates. Keeping your programs up to date, including basics in your operating system and the software that drives hardware such as your printer and speakers, can help extend the life of your computer and is a crucial part of computer and smartphone hygiene. Updates not only add new features but also address glitches that can affect smooth operation or vulnerabilities that malware could exploit. 4. Delete unneeded programs and files. On both your smartphone and computer, make a New Year's clean sweep of apps and programs you no longer use. Not only will you reclaim wasted storage and potentially speed up your device, you’ll reduce the number of programs clamoring for updates — and crucially, the number of programs that could allow ever-evolving malware onto your devices. To reclaim space on cloud services where your photos and phone data are backed up, check out our guides to freeing up space on Google Drive and iCloud. 5. Deep clean your computer and smartphone. If you’ve been merrily allowing programs, files and photos to download to any location on your devices they please, chances are your computer and smartphone or tablet could use a deeper clean to see in 2017 in style. Removing unwanted files goes a long way toward speeding up operation. A solid digital organization system will make future decluttering far less arduous. Tackle the organization now with our guides for cleaning and reorganizing your computer and freeing up space on your smartphone. Don’t forget to clear your smartphone address book of defunct or duplicate contacts. 6. Do a privacy tune-up. Last year saw developments including an amendment that gave the FBI new powers to hack computers, the breach of 1 billion Yahoo accounts, and the installation of billboards that digitally track passersby. Your top priority in 2017 should involve fortifying the virtual barriers that protect your data, from where you click to what you search for and what you like on Facebook, Twitter and beyond. Advertisers and providers of free services like Facebook have a great incentive to encourage users to keep their privacy controls at a minimum. Your preferences and movements online are the key to the necessary evil of these glorious internet times: targeted advertising. But blocking all ads can deprive your favorite sites of much-needed ad revenue. Try browsing the web anonymously. Use a private search engine like DuckDuckGo, or download an anti-tracker plug-in such as the Electronic Frontier Foundation's Privacy Badger, which stops companies from creating a profile based on your clicks. You’ll still see advertising; it just won’t be targeted specifically to you. Check out our guide to private web browsing. If you use public Wi-Fi networks frequently, it’s crucial that you use a virtual proxy network such as NordVPN (affiliate link) or Buffered VPN to encrypt any data that’s transmitted. This will prevent anyone who's spying on the network from collecting sensitive details such as your login details. Study up on how to protect your privacy on a public connection. As for privacy on Facebook, the juggernaut of data hoarding, you'll want to consider a myriad of privacy settings that give you a measure of control over the personal details and history that can be viewed by people and brands. Head over to our guide to Facebook privacy settings to make sure your settings aren’t exposing more than you’re comfortable with. 7. Recycle old electronics and batteries. A recent United Nations report (opens a PDF) estimated that up to 50 million tons of electronic waste, mostly smartphones and computers, will be dumped in 2017. Along with contributing to already overflowing landfills, e-waste can introduce toxins into the surrounding soil and water, creating health risks for people. Instead of discarding that slightly sluggish iPhone or older Android, follow these tips and sell it online. Even if you haven’t kept your device in tip-top condition, many resellers will be happy to purchase it for parts or to refurbish. Just be honest about the state your gadget is in. The same goes for an unused computer. Before you sell it, make sure you safely clear your personal data and passwords. As for batteries, while not all household batteries (the AA or AAA types that power things like keyboards or clocks) are toxic when tossed, making the effort to recycle them means they could enjoy further life as other products and keeps them out of the landfills. This guide from Earth911 helps you figure how and where to recycle single-use batteries. If you don’t already have a system for backing up your digital life, now’s the time to start saving crucial smartphone photos, work documents and other digital projects in more than one location. One easy solution is to sign up for a cloud storage service. Cloud backup can automatically save your data in the background so that your most important (or indeed, all) files are continuously saved online. They'll be accessible in the event your device crashes or gets lost or stolen. Look over the reviews and ratings for our favorite cloud services of the year. If you create tons of large files in music, video or photo editing programs, one or more external hard drives might better suit your needs. Cloud storage accounts usually top out at 2TB. We like the Seagate Backup Plus 3TB ($99.99 on Amazon). This drive also comes in 4TB ($119.99 on Amazon), 5TB ($138.99 on Amazon) and 6TB ($190 on Amazon) capacities. 9. Unplug and tune out every so often. Technology helps us connect more efficiently to more information and people than ever before. Yet as more of our daily tasks and socializing are accomplished online, the very technology that enables us could also have adverse effects on our health. Multitasking, more common than ever now that people have multiple screens at their disposal, has been repeatedly shown to decrease focus and productivity. Reclaim your time and mental clarity by mindfully interacting with your gadgets. Decide when to simply not to reach for your smartphone, and turn off app notifications so you’re the one who decides what you react to and when. Here's to a productive and enjoyable 2017! 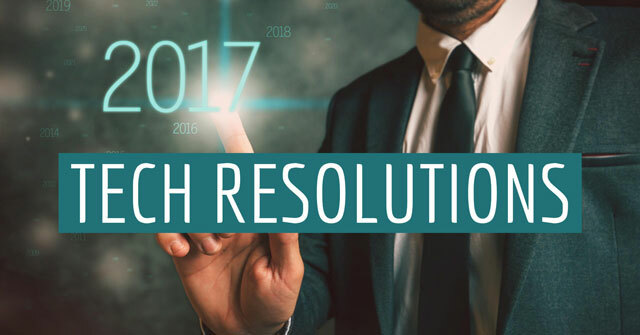 What are some of your tech resolutions for the year ahead?